In front of a raucous sellout at Hec Ed, the Huskies were terrible, losing 55-47 to Oregon and casting considerable doubt on their NCAA tourney chances. For those who look upon on the NCAA men’s basketball industry as only slightly less corrupt than the Pentagon, more eyebrows broke the arch limit Friday. Louisiana State coach Will Wade was suspended after a report that he was recorded on an FBI wiretap talking to convicted fraudster Christian Dawkins about making payments to a recruit who became his starting point guard. LSU won the Southeastern Conference championship anyway. A little indignity never hurt anyone, right? Related charges have already produced prison sentences for three go-betweens in the two-year-old FBI investigation. More is coming. Arizona coach Sean Miller gave what sounded like a farewell to fans in Tucson’s McHale Center Saturday following the Wildcats’ loss to Arizona State. Just in case you’re a Huskies fan who watched your team Saturday night fall off the edge of the earth, we offer the big hoops picture for context. If you have perspective, Saturday’s outcome doesn’t feel as bad. Alas, college basketball fans in March have no perspective. They have madness. Or in the Montlake case, sadness. The Huskies saved the worst game of their otherwise remarkable season for last. Ahead of the Pac-12 Conference tourney in Las Vegas starting Wednesday, the league’s regular-season champion (24-7, 15-3) cracked, splintered, crinkled and turned to dust against Oregon’s pressure defense. At home. In front of a sellout crowd. On senior night. For the first time this season, they lost at Hec Ed. If the NCAA selection committee had to fill out its tourney bracket after the game, the 55-47 loss to the Ducks would have bounced the Huskies from the 68-team field. The NIT would have turned its back. The Cheez-It Bowl would have said hell no. The defeat showed how vulnerable Washington is. The regular season’s final four games became a showcase for scouts watching UW. The vaunted 2-3 zone is not so much a problem if mid-range jumpers are taken and made, and the offense can be thwarted with pressure in the grill of point guard David Crisp. Matisse Thybulle, the likely Pac-12 player of the year, gave the Huskies their only lead when he opened the game with a three. He indicated they had no rally in them. He even owned up a bit to the consequences of the pre-game festivities. 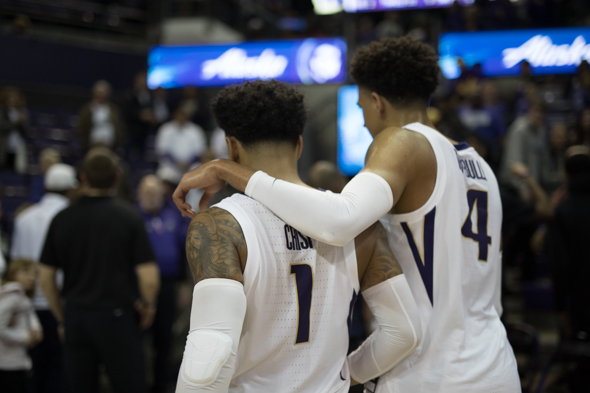 The Huskies’ four seniors — Thybulle, Crisp, Noah Dickerson and Dominic Green — were deservedly saluted for perseverance that led to renaissance. Families joined them on the court, videos hailed their feats and giant replicas of their jerseys were awarded. It’s hard to believe that two years ago, they were part of a Washington team that lost its final 13 games. A fifth guy on the team was Markelle Fultz, who three months later was the No. 1 pick in the NBA draft. They finished 9-22, 2-16 in conference, tying for the most defeats in school history, costing their beloved coach, Lorenzo Romar, his job. But four days later, new hire Hopkins began his campaign to keep them at Washington. It worked. The payoff figured to be Saturday, when a quality win would help set them up for an NCAA tourney berth. But it appeared, even with four seniors who’ve been through much, the moment was too much. No, not really, not compared to Oregon (19-12, 10-8). The Ducks were playing only for seeding in the Pac-12 tourney, but they had heads and hearts into it. The Huskies did not. The Ducks out-rebounded UW 37-28, forced 15 turnovers and hassled the Huskies into missing 17 of 20 treys. And this was the same UW team that won in Eugene 61-56 on Jan. 24. Now it’s a team that finished 2-2, losing at league-worst Cal by three, winning at Stanford by one, winning at home by five in overtime Wednesday against Oregon State, then gas-piping against the Ducks. “They had us on our heels,” Thybulle said. “It took us a little while to figure out what was gong to work for us. They continued to switch up on us and we couldn’t get comfortable. The Huskies barely have more practice time to figure it out. As the No. 1 seed in the tourney, the Huskies fly Tuesday and get to skip the opening session Wednesday. They play at noon Thursday against the winner of the 8-9 matchup between USC and Arizona, both of whom they beat during the season. Wins Thursday, Friday and Saturday assure them of the conference’s automatic berth in the NCAA field. Any loss will invite selectors musing on at-large entries to examine what happened to Washington Saturday at home on senior night. In their four years, these seniors have overcome much. It only seems to get harder. well, there is always the NIT. It provides an opportunity for the team to get extra work in for next season. BUT with 4 seniors how would the young guys get to play? Sit the seniors for the one and done NIT game…..OR just forget it. PLEASE! Let’s not go NIT yet. The league remains weak, and three wins in three games is not unrealistic. 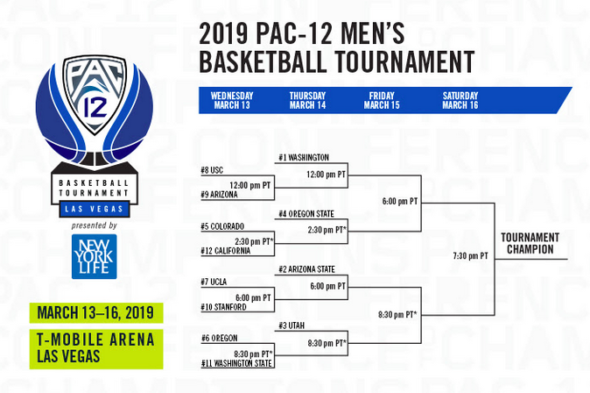 UW is an 8 or 9 (more probable now) no matter the outcome last night or the outcome of the PAC-12 tournament. They are a lock for the NCAA tournament…..the sky is not falling. If they lose Thursday, they won’t get the auto bid, and will be back where they were in 2012, when the committee didn’t take the reg season champion. Not saying the won’t be selected, but they don’t have a signature win, and will have lost three of the final five. A lock? No. I disagree. A 24 win team that is the regular season champion of a major conference with a three game cushion over the #2 team has done enough to get in. No signature wins, but a two point loss on the road to Gonzaga will get the committee’s attention. (If I remember correctly, 2012 was a cluster of really bad teams…..the PAC-12 may not be great this year, but UW has separated themselves from the rest of the PAC.) I think this team is a #9 seed if they lose in Vegas at any point, and a #8 seed if they win out. Unlike most who visit Sin City, there isn’t a whole lot for the Huskies to gain or lose next week. The Pac-12 is worse this year, and the last four games refute your contention that they’ve separated themselves. They did, then fell back. I’m sure the committee feels no obligation to take a second team from the P12, especially if it’s the Huskies playing as poorly Thursday as they did Saturday. I don’t know….even after playing poorly the last for games (going 2-2), maintaining a three game lead over the #2 team in the conference points out how much separation really was achieved. Maybe they’ll get bumped down to a #10 seed, but no worse. All will be revealed next Sunday, I guess. Conference standings/record play little to no part in the committee deliberations. Especially with the new NET metric. More automatic berths reduce the selection of at-large teams whose better body of work gets diminished by a one-and-done freak loss in a conference tourney. UW had four assists for the entire game. The most tell-tale stat of the game. I remain confused. Are they a “bad” good team (that makes the Tournament)? Or a “good” bad team (that doesn’t)? Welcome to the bubble. Watch your feet. The ground is soft. My twentyfive years in Portland trump my 14 years up in Washington so Saturdays game worked for me. After losing Bol early Dana Altman has worked hard to get what he could out of this year. Not only was it Senior Night, but of an immediate nature, nothing was on the line. Realistically how far might an informed person expect the Huskies to go into the tournament? However they match up against the Zags, have you seen Duke even without Williamson? No amount of purple passion puts Washington among the top 30-40 teams in the field. But the field is 68, and Washington as a 7-8-9 seed is easily capable of winning once, especially with its zone. They have an outside chance of winning twice if they play a mostly flawless game.